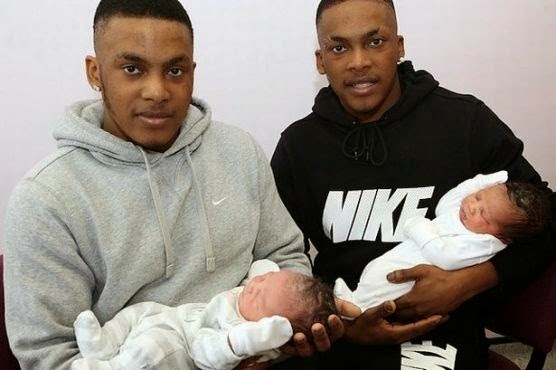 Twin brothers Jeromme and Jarelle both became dads a couple of days ago by different women, and they both had boys! What's even more amazing is that the twin's partners gave birth on the same day at the same hospital by the same midwife! Initially, the twins were told their partners had the same due date of Nov. 26, but as it would be their first children, neither believed the babies would be born on that day. The UK Mirror reports that the twins were initially shocked but remarkably, while the babies came before the due date, they were still both born the same day - two days early - at New Cross Hospital in Wolverhampton. Incredibly, both babies were born in the same water pool in the same room and were delivered by the same midwife. Jeromme's partner Tegan Compton, 19, was first to give birth when 8lb 7oz Cameron arrived into the world at 2.04am on Monday morning. Jarrell's girlfriend Francesca Ashe, 19, then followed suit when she delivered 7lb 11oz Cassen two-and-a-half hours later at 4.34am. Jeromme, who works in a sports shop, said: "We knew that our partners were both given the same due date, but we just never expected the births to be really on the same day. "Tegan and me came in first and little Cameron was born just a few hours later. Then the pool was washed and cleaned, and we handed over to Jarrell and Francesca." Jarrell, who works for a catering firm, added: "We got here at about two in the morning and we could hear someone's voice and I said, 'that's Tegan'. "Mum was with me so when Tegan gave birth she went over to see her grandson and then a couple of hours later she had another one. It is absolutely amazing that we became fathers of sons on the same day. It is great for everyone and everyone at the hospital was great." Midwife Barbara Kapoor, who delivered both babies, said: "I have never ever heard of this happening before. It is amazing."